The Speaker: A Liberal Review was a weekly London newspaper published by Cassell & Co. Ltd., London and later by Mather & Crowther, London. It ran from 4 January 1890 to 23 February 1907. On 2 March 1907, The Speaker was continued by The Nation, The Nation Pub. Co., London. 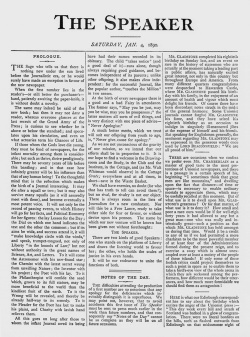 The newspaper published 4 articles and 8 poems written by Arthur Conan Doyle between 1892 and 1898. This page was last edited on 9 September 2016, at 09:54.